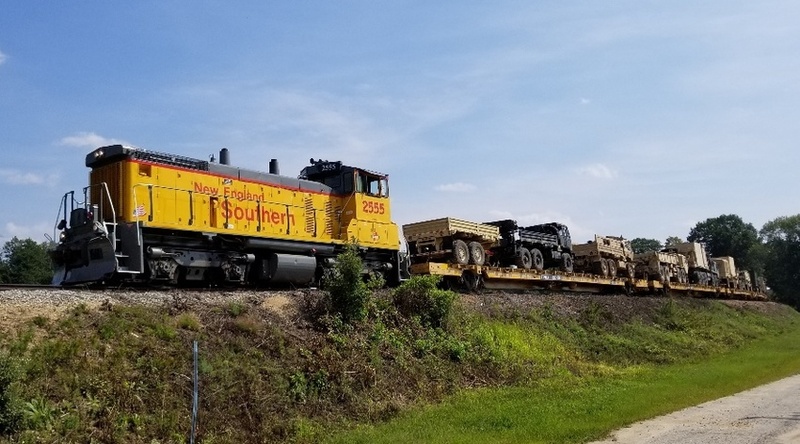 The NH National Guard's 2018 Military Train originated and terminated with New England Southern Railroad at their World Headquarters in Canterbury. This was the first cut of cars that would be brought north to Canterbury for an unloading session that took place in a rapid fashion. Here was New England Southern's SW1500 Crew heading north while passing through Brochu's Nursery. Always top notch "NEGSxtraordinary" work and ingenuity from the New England Southern Railroad Crew ! Photographed by Jay Gadon, August 28, 2018. Added to the photo archive by Jay Gadon, November 2, 2018.